A FINE & RARE COLONIAL/FRENCH & INDIAN WAR PERIOD AMERICAN-MADE MUSKET, ca. 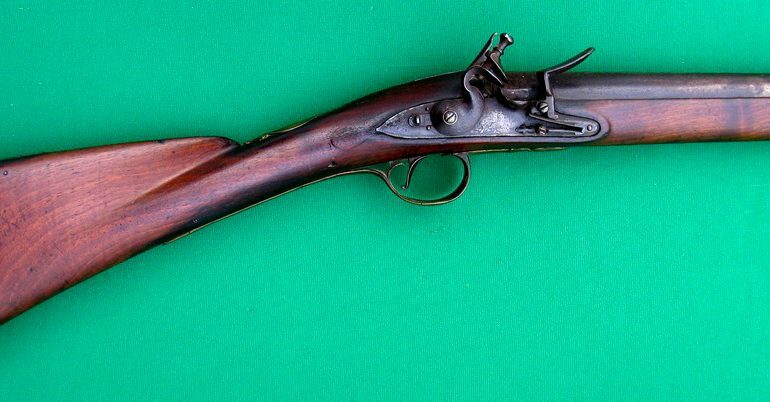 1760: Of Longland Pattern/First Model Brown Bess design and in overall fine untouched original flintlock condition. Unmarked, pin-fastened, American made, round, 44 1/4″, smoothbore, .75 caliber, barrel with a top-mounted bayonet lug/front sight, a minor dent at the muzzle and a baluster turned breech. 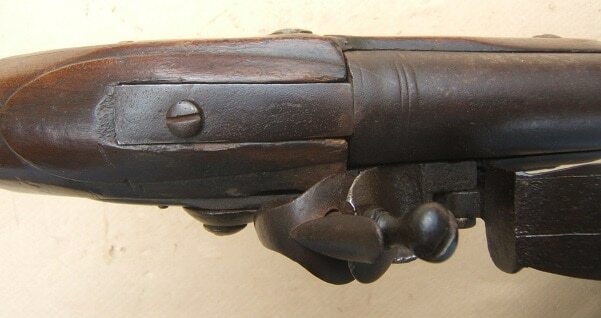 Molded and carved, American-Walnut, Brown Bess type fullstock with simple raised-carved points, around the lock and sideplate mortises, a pronounced lobe at the ramrod entry, a raised beavertail apron at the barrel-tang and a deeply fluted comb, on the buttstock. Colonial American manufactured & Recycled “Brown Bess”, brass furniture. The Longland Pattern buttplate with a long stepped tang. Four (4) sheet-brass American-made ramrod pipes, a raised Longland Pattern/1st Model Brown Bess sideplate with a tail, a pin-fastened nose-cap; and the Brown Bess type trigger-guard with a piercing for a swivel and a raised hazelnut forward finial: not made for a wrist escutcheon, as is typical of many American arms. American made, rounded Lock with a slightly crude, rounded, banana-form lockplate, a bridle-less powder-pan its original gooseneck hammer, matching frizzen and teardrop finial frizzen-spring. The lock with deeply toned, untouched, steel surfaces with light scattered patches of discoloration/fine pitting. 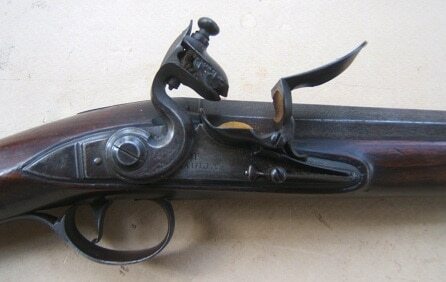 In fine untouched, original flintlock condition with a strong mainspring and good timing. The iron surfaces of the barrel with a deeply tone, gunmetal-gray, smooth age patina and the expected light signs of use and wear: fine touch-hole. Fine stock with 85%+ finish, sharp contours some minor handling marks and light signs of use/wear. Nicely toned brass furniture with a rich age patina and choice surfaces. 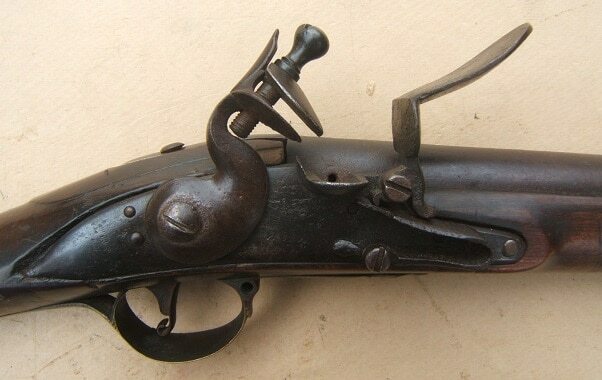 A classic example of a French & Indian War/Colonial Period American-Made Musket, ca. 1760. Complete with its buttonhead iron ramrod: sling-swivels removed. Overall length, 59 1/2”. For similar examples, please see G. C. Neumann’s: “Battle Weapons of the American Revolution”.